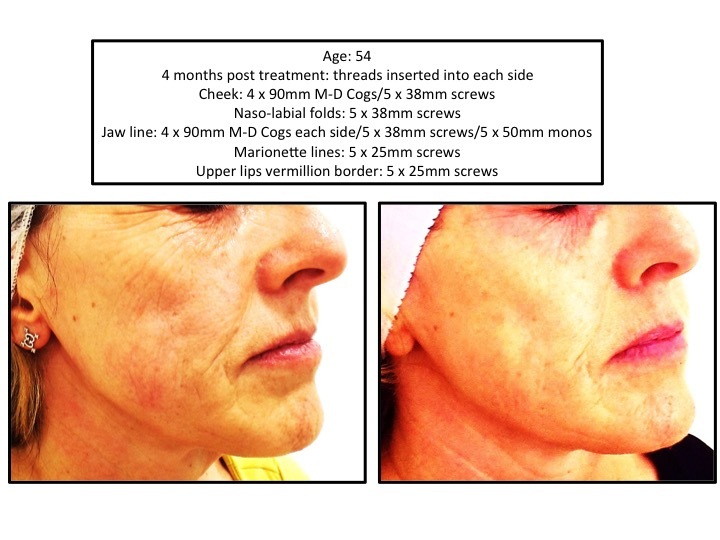 A thread lift is a minimally invasive treatment, with the aim to rejuvenate, tighten and lift the skin. While anti-wrinkle injections mainly focus on softening unwanted lines and filler treatment restores volume, only threads are able to physically lift up skin that has lost its elasticity. You may have heard the saying PDO thread lift, the letters PDO refer to Polydioxanone. Polydioxanone has been used as surgical suture material since the 1970 and has an excellent safety record. It breaks down entirely after about 6-8 months. When it was discovered that the body produces collagen alongside PDO sutures its potential in aesthetic medicine became evident. Today we use threads attached to fine needles to place them under the skin in a mesh-like fashion. The body generates vast amounts of new collagen along the threads which leads to impressive tightening of the skin. Deep lines, folds and saggy skin can be treated without the need for surgery. In recent years barbed threads have been introduced which allow an immediate lifting effect upon placement. PDO Threads can very effectively strengthen the contour of the face, reduce roundness, lift sagging skin in the cheeks, jowls, neck and also produce an excellent eye brow lift. Because PDO threads utilize the bodys ability to deposit collagen there are certain contra indications to this treatment. PDO threads are generally a very safe treatment with only few and minor complications. We will assess your treatment needs, expectations and listen to your concerns. Any contra indications must be excluded. Therefore you will have a thorough consultation. At this point we will explain the procedure and all aspects of this treatment in detail to give you a good idea and understanding of thread lifts. It is recommendable to plan at least two days of rest following the placement of barbed threads (cogs). Plain threads are a typical “lunch time” procedure and generally do not require any down time. Local anaesthetic is injected into the treatment area. The PDO thread will then be introduced using a cannula or micro-needle in the required area. The procedure takes around 45-60 minutes, depending on what treatment you will require. You will be able to fully resume your everyday routine and social commitments within a couple of days, in case of mono threads even within 1 hour after treatment.. PDO Therapy is a tailor made treatment which can be adjusted to your requirements at any time. 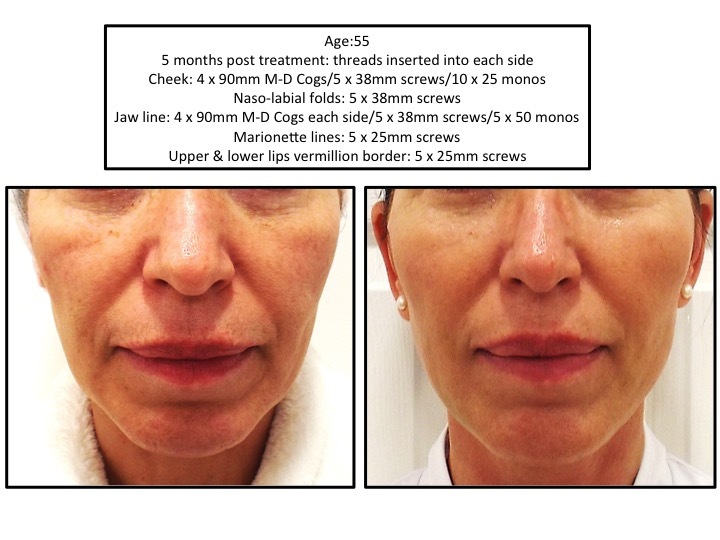 When you combine PDO Therapy with Fillers and Botox great results can be achieved. Depending on the type of thread, area and extend of treatment you will experience anything from very little discomfort to a jagging sensation which can last up to a couple of weeks. The more lifting you want to achieve the more discomfort is to be expected. We will advice you on precautions to avoid possible infections, achieve an optimal lifting result and care for your threads. WHO IS A GOOD CANDIDATE FOR PDO THREADS? The best candidates are men and women who are beginning to experience the appearance of wrinkles on the forehead, drooping of the brow, sagging of the mid and lower face, visible jowls and loose skin on the neck. WHICH AREAS ARE MOST EFFECTIVELY TREATED WITH THEPDO THREADS? For the face, these would be lifting of the eye brows, naso-labial folds, marionette lines, cheeks, jaw line and double chins. For the body, good results are achieved with tightening of loose skin on the arms, thighs and abdomen. WHAT ARE THE PDO THREADS MADE OF? These threads are 100% Polydioxanone which is a clinically proven bio-compatible and bio-absorbable material that is already widely used in medical suturing. CAN PDO THREADS BE USED ALONGSIDE OTHER AESTHETIC PROCEDURES? 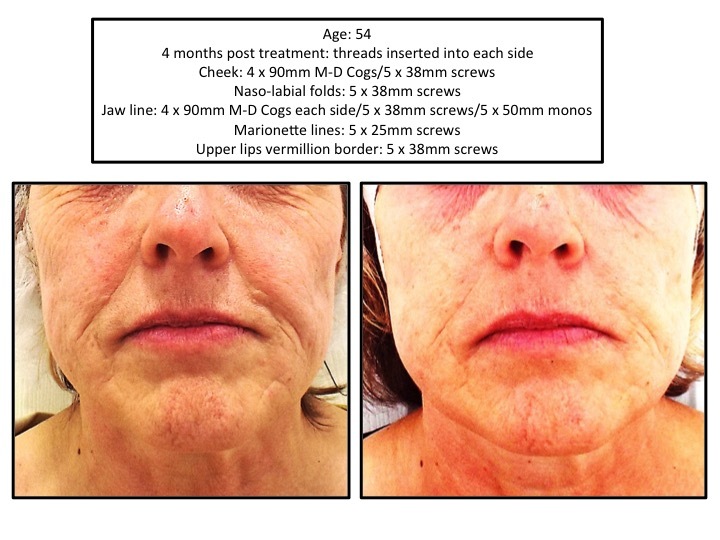 PDO Thread Therapy can be used alone or can be combined with other treatments to deliver optimal results eg: Fillers, Anti-wrinkle injections, Micro-needling, Peels, Radiofrequency and Fractional laser treatments. WHO SHOULD PERFORM THE PDO THREADS TREATMENTS? Only trained professionals who have attended training and are experienced in delivering facial aesthetic treatment are certified to perform this procedure. WHEN DO YOU SEE RESULTS WITH THE PDO THREADS? There is an immediate improvement seen after treatments with a visible lift in the areas treated. This will improve over a period of 2-6 months as new collagen grows between the threads and gives further lift and tightening to the skin. The PDO threads gradually dissolve over about 6 months, but the resulting lift remains. HOW LONG DO THE RESULTS USUALLY LAST FOR? This varies depending on the patient’s age at the time of treatment, the quality of the skin, degree of sagging and the number of threads used. However, studies have shown that results can last between 2-3 years based on lifestyle. ARE THERE ANY SIDE EFFECTS WITH THE PDO THREADS? PDO Thread lifting is a very safe procedure and complications are extremely rare. Minor complications may include temporary swelling and bruising. Patients may feel slight tightness or a pulling sensation following the treatment but this subsides over a few weeks. HOW EXPENSIVE ARE PDO THREAD TREATMENTS? Prices start at around £200 for smokers lines and then increase depending on the number of areas treated. For a FREE Consultation at our Preston Clinic please complete the simple form below and we will be in touch. I have been coming to Defyne for Botox and Fillers since they opened in 2014. Pinar is the best practitioner I have been too and I have been to many. I am so pleased she decided to introduce thread lifts to her portfolio. I had previously had a thread lift in America, which was great, but Pinar recently treated me and I am over the moon. I can’t say enough how pleased I am with the results! Interested in a treatment at our Preston Clinic? Simply call Kate or Pinar on 01772 780 808 to discuss further and to arrange an appointment for a FREE, No Obligation Consultation.